My mother wasn’t such a bad cook. The younger generation remembers her salad-with-slugs and her gingersnap cookies with chili powder, but that was well after she lost her vision to macular degeneration. I remember when she used to bake like Emily Dickinson; for contemplative reasons, to escape the everyday world. Baking was not my mother’s tradition; she grew up in a distinctly non-cooking family. Her father had been raised in military barracks where bread was baked communally and the Sunday roast was bought from the military kitchen. Her mother had lived a soft, well-to-do life until the age of ten, when she was sent to boarding school after the family split up. My mother never baked anything until she married a farmer in the Dirty Thirties, and then she had no choice; bake it or do without. She baked; bread, cakes, cookies, doughnuts, biscuits, scones (never muffins though). One famous Christmas she decided to make cookies from around the world and tried every recipe from the Alberta Gas Cookbook. I remember only one, pepper nuts, which we were horrified to find, had real pepper in them and were as hard as stones (maybe that was a precursor to the chili cookies, now that I think of it). I recently inherited my mother’s recipe box. It is small and smells like lard and the bulk of the recipes are for cakes and cookies. She frequently corralled people to write out recipes for her, and I see a few that I handwrote for her fifty years ago. The recipes are from everywhere; CBC Radio, her daughters-in-law, her friends and neighbours; cut out of magazines and off boxes. Here are two recipes from her collection. Put in bowl and beat for 3 minutes. Cook at 350 for about 25 minutes. The ingredients reflect the times of the recipe. 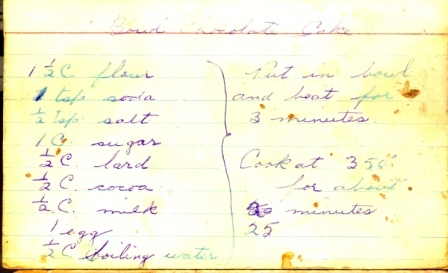 Lard was considered essential in this recipe; saturated fats were not an issue in the 1950s and voluntary vegetarians and veganism unheard of. It wasn’t necessary to put in the pan size (but my mother always made it in a rectangular pan) nor was an icing recipe needed. The test for doneness – to stick a toothpick in – did not have to be specified for an experienced cook. One-bowl chocolate cake is famous in my family. It predates the cake mix, and could explain why cake mixes were seldom made. Who would need one, when the one-bowl cake took three minutes? My mother made this cake at least once a week. The time I remember best was when she baked and iced the cake and left it on the counter for the minister’s visit. When she went to cut the cake, she discovered a series of little bird tracks; my pet budgie had checked out the cake thoroughly (but not left any droppings, that was lucky). I can’t remember if she served the cake anyway, but she told the story a lot of times. 1 pk. yeast in very warm water – rise 10 min. Make a stiff batter, add fruit – rise about an hour. Cook in hot fat dropped from 2 spoons (to shape). There are many stories in this recipe. For one thing, it reflects my mother’s openness to culture. I married a Dutchman and our first New Year’s together, he wanted to have oliebollen, but he did not know how to make them. My mother figured out that oliebollen were a type of deep-fried fritters and she made them for him. It created a bond between them that lasted for forty years, until she died. I think my mother probably got this recipe a few years after her initial effort, when she visited my brother and his family who spent a year in Holland. 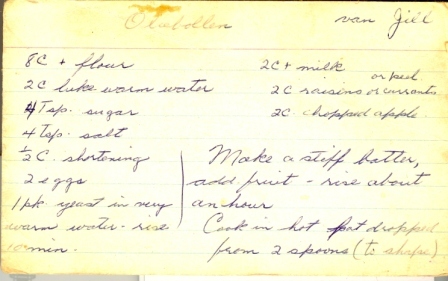 My mother used the Dutch, “van Jill” as opposed to the English “from Jill” to indicate that her granddaughter had given her the recipe. For some reason I find this touching. She wanted to do things authentically, and acknowledge that Jill and her family were not just visiting Holland, they were living there. It makes me think that I didn’t know everything about my mother.